Consider yourself one of us? 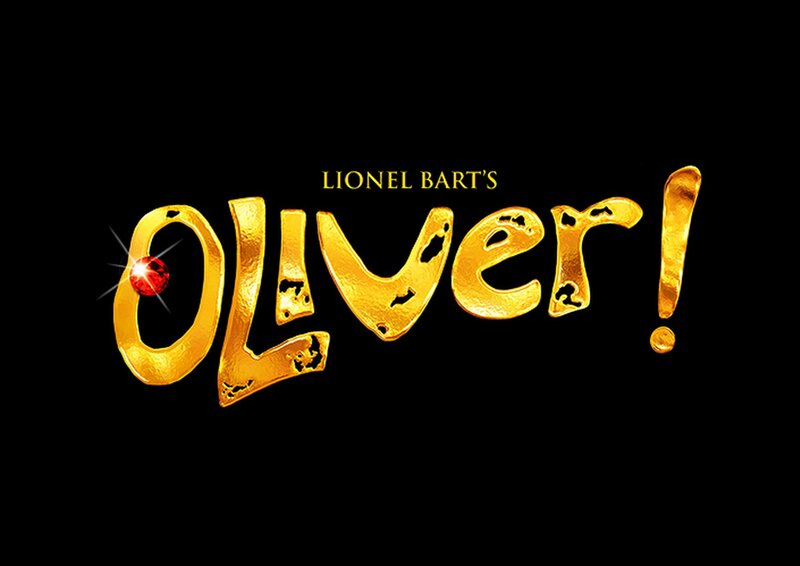 The Mercury Theatre, in collaboration with Colchester Operatic Society and Colchester Operatic Society 2nd Edition, are preparing a grand production of Lionel Bart’s Oliver!, and we would love for you to be involved. Performance dates are 27th September to 12th October. 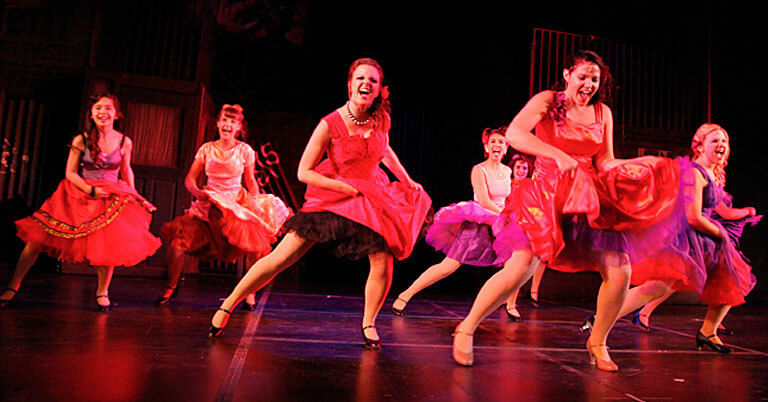 How can you Audition to be a cast member in this amazing experience? If you wish to play a Workhouse Kid, be in Fagin’s Gang orbe considered for the role of Oliver, Artful Dodger, Bet, or Nancy, you will need to apply in advance by preparing a video. For your video, please state your name, age, hobbies, and explain briefly why you would like to be involved in this production. We would also like you to sing a song from your favourite musical. You must be 11 years of age or over on the day of the audition, Sunday 5th May 2019. Applicants for Bet must be over 16, and for Nancy must be over 18. All applicants will be notified by email on April 24th 2019, if they are shortlisted to the next stage. 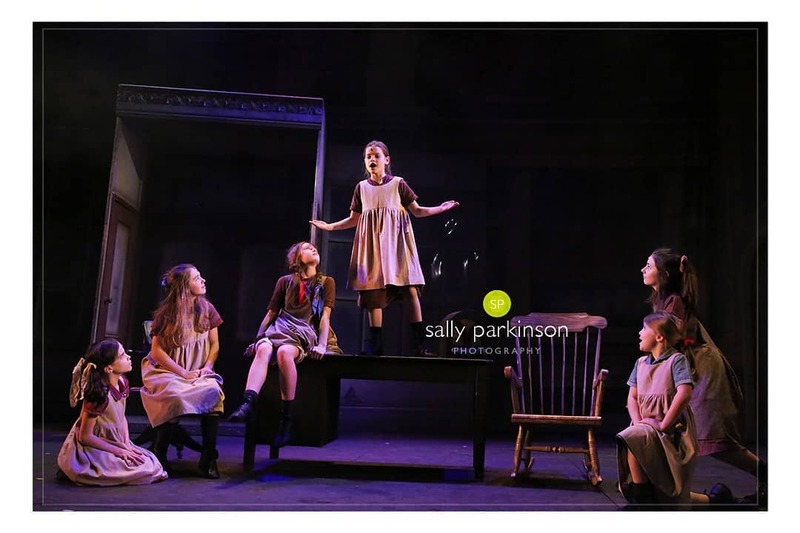 Successful video applicants for Oliver, Artful Dodger, Workhouse Kid or Fagin’s Gang will be invited to attend a pre-audition workshop on either Wed 1st or Thu 2nd May (7.30pm – 10pm) to prepare for an audition to be held on Sun 5th May (9.45am – 4pm), all to be held at the Abbey Field Centre (Circular Road South, Colchester, Essex, CO2 7UW). Successful video applicants for the roles of Bet and Nancy and those who wish to audition for any other roles are invited to attend a pre-audition workshop on Wed 8th or Thu 9th May (7.30pm – 10pm), prior to an audition on Sun 12th May (9.45am – 4pm), at the Abbey Field Centre. To attend, please register your interest by sending your name, playing age and a contact email address to cos1theatre@hotmail.com by 24th April 2019. Exact timings for the day will depend on numbers and we will let you know prior to the day. There is no need to prepare an audition piece but you would need to fill out an Audition Form (downloadable from both COS and Mercury websites) and bring this with you. 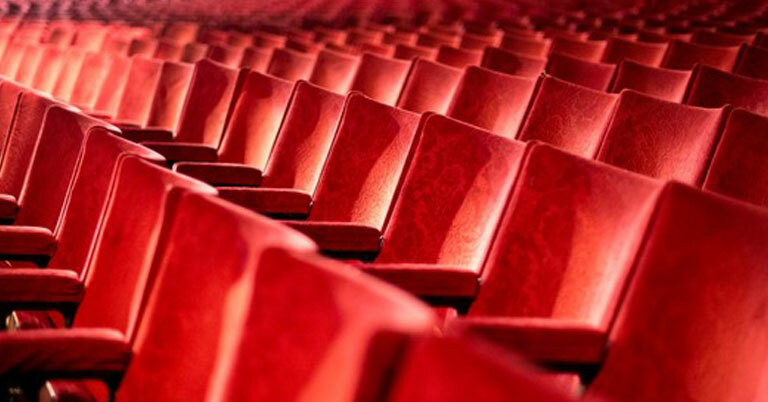 ATTENDANCE AT ALL TECHNICAL REHEARSALS, DRESS REHEARSALS AND PERFORMANCES IS COMPULSORY. Please do not audition if you cannot commit to these dates. Should you miss three rehearsals without prior notification and approval, you will be asked to forfeit your place in the Oliver! company. Any fees paid are non–refundable. The professional Creative Team – Directing the show will be Ryan McBryde who has had recent successes with Pieces of String and Moll Flanders. Charlie Morgan, regular choreographer of the Mercury pantomime will choreograph and assistant direct the show. Taking up the baton is James Cleeve who musically directed Liza Pulman sings Streisand, which visited the Mercury last year. Costumes and set will be designed by David Shields, known to the Mercury audiences for his extravagant pantomime designs (Jack and the Beanstalk, Snow and the Seven Dwarfs) and the John Cleese farce Bang Bang. The Sound Designer will be Chris Bogg who has designed the Mercury productions of Spamalot, Pieces of String and the last three pantomimes. All participants will need to be a member of Colchester Operatic Society or Colchester Operatic Society 2nd Edition in order to audition. 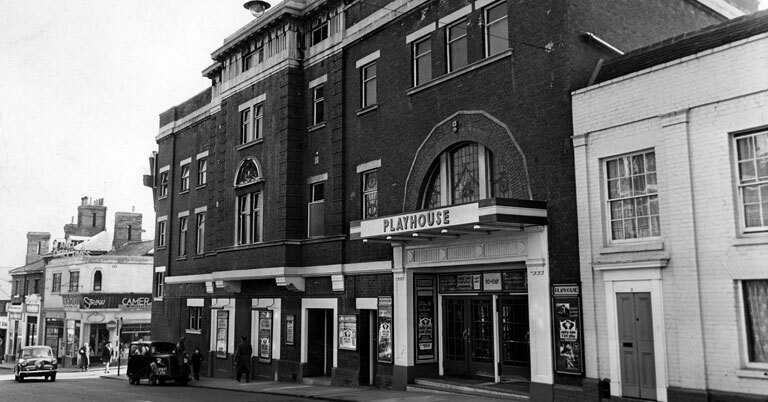 A membership fee of £10.00 will be collected at the pre-audition stage. Successful candidates will be required to pay a show fee of £75.00, payment to be made at the first rehearsal. Cash and cheques accepted (cheques made payable to Colchester Operatic Society), card payments also accepted with an additional fee to allow for admin costs. Cast members will be expected to provide their own stage footwear and some personal items (tights, etc.). If you are concerned about this, we will be offering 5 Bursary places where your fees will be paid for you and all costumes provided. Please do let us know if you would like more information. Colchester Operatic Society works closely with Essex County Council to ensure compliance with the various Child Protection Legislation. Colchester Operatic Society (COS/CO2) now have a “Child Protection Policy” available on the COS website. A copy to view will be available at all rehearsals and performances. Broadly speaking this affects all members aged 16 or under. Registered chaperones will be responsible for the care of members until they are returned to parents or parent-nominated adults. We will endeavour to finish rehearsals and performances at the notified times and would respectfully request that parents collect their child promptly at that time. A chaperone will stay with members until they are collected. They will not be allowed to leave unsupervised. Should you require any further information, please email Colchester Operatic Society cos1theatre@hotmail.com. 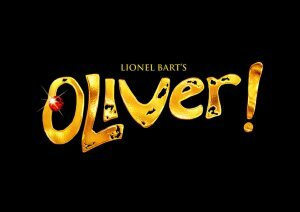 ‘Consider yourself one of us’ as we join forces with Mercury Theatre to bring you one of London’s most popular musicals Oliver! in the Mercury’s brand new off-site temporary location, Mercury at Abbey Field. 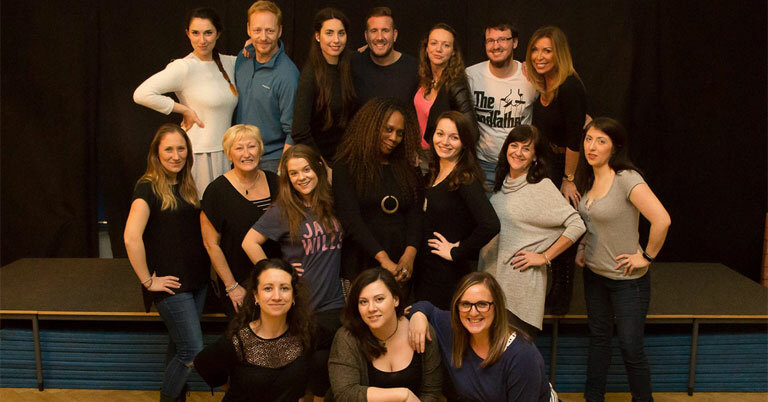 The Mercury has worked with Colchester Operatic Society many times in the past, but this will be the first full collaboration, combining professional creatives with local community actors and children. Oliver! promises to be an event not to be missed, packed full of song, dance and Oom-pah-pah! Catch it from 27 Sep – 12 Oct.
General Sale is now open so Book now! 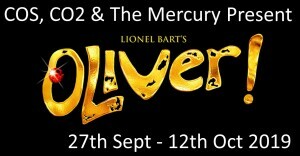 Just visit the Mercury Theatre’s website to get your tickets! 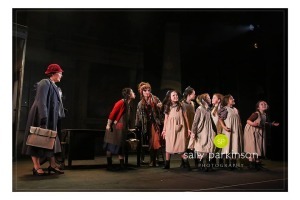 Tonight is opening night for our cast of Annie. Break a leg everyone and have a great show! There are still a few tickets available from the Mercury Box Office. Join Annie, a plucky, charming orphan girl, and her loveable adopted mutt named Sandy, as they take you on a musical adventure in 1930’s New York. Annie dreams of finding her real parents and escaping her dreary orphanage which is run by the cruel and tyrannical Miss Hannigan. Annie’s dreams begin to come true when the personal secretary of billionaire Oliver Warbucks invites her to stay with them. 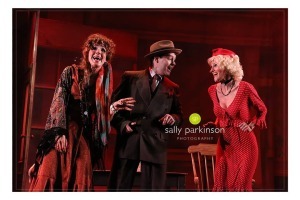 Miss Hannigan and her undesirable friends, however, have other plans! 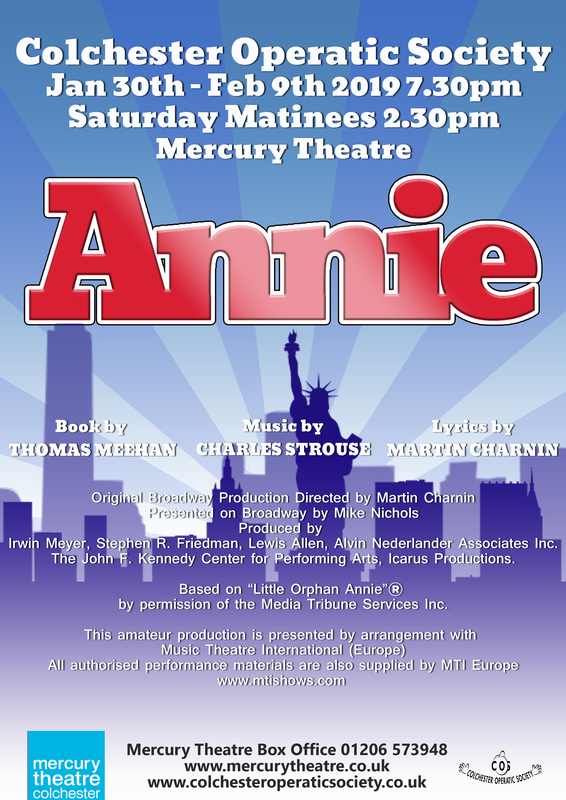 So let Annie into your hearts and come and see Colchester Operatic Society perform this award winning, family friendly musical that includes great well-known songs, including “Tomorrow” and “It’s a hard knock life”. 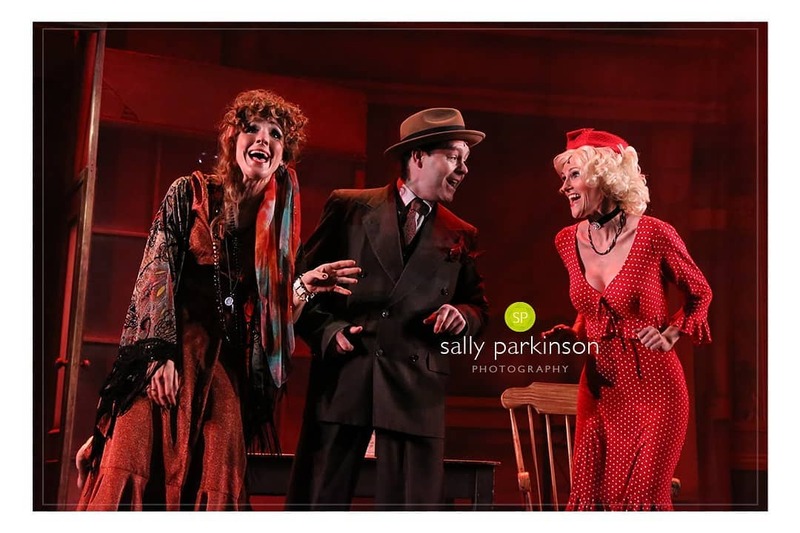 This local amateur dramatic company are well known for producing professional quality shows, so let them entertain you with their beautiful harmonies and a story full of fun, heart and adventure. Congratulations to all those successful cast members and thank you to our audition panel for what must have been some tough decisions.